University High School offers a well-rounded social studies curriculum that features standard 9th and 10th grade courses (World History/AP World History and U.S. History/AP U.S. History, respectively) and several elective courses for upperclassmen. To graduate from University High School, students must earn eight credits (one credit is earned each semester) in social studies. The study of history is valued by University High School, and this value is illustrated by the graduation requirement of eight semesters of social studies credit. 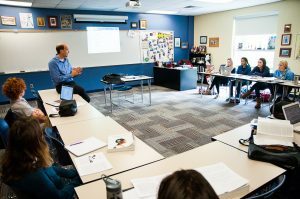 There is a clear scope and sequence to the social studies curriculum so that students experience a general coverage over time, geography, and cultures through required classes in nonwestern history, western history, and American history. Teachers use various methods to address individual student needs in a personalized manner. 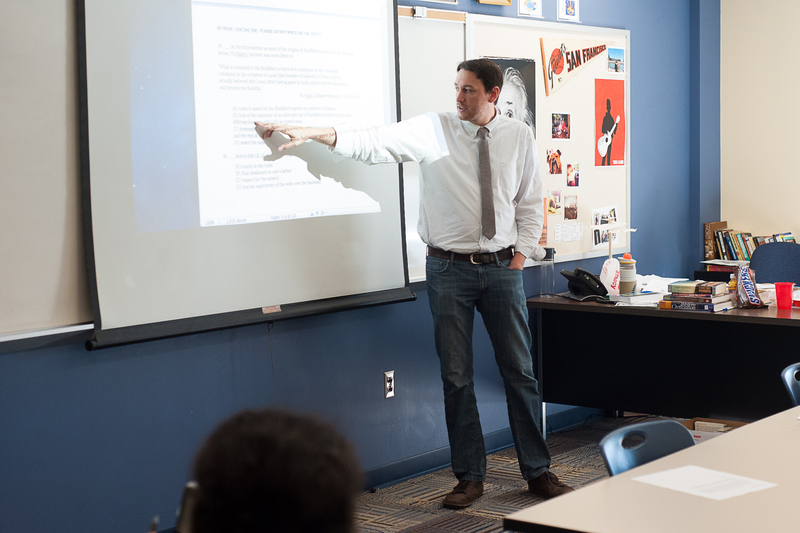 Courses and teachers in the social studies department emphasize writing. Social studies teachers bring a broad range of experience and interests to the school. This course is a broad study of human history. The course will touch on the major developments of human civilization across the globe. Roughly equal attention will be paid to each region and period covered, giving students a wider perspective of the events and peoples that shaped our world. Particular focus will be on the development of historical thinking and writing skills, which will prepare students for future history courses at University and beyond. The AP World History: Modern course is a global study of human history, concentrating on the period between 1200 C.E. and the present. Given such a breadth of time and geography, the course is organized to focus on developing students’ skills of historical analysis using a thematic approach. It is taught at the level of a college survey course, and it follows the guidelines provided by College Board’s Advanced Placement program. As such, the academic expectations, amount of reading and writing, and testing are significantly greater than in the regular World History class. If we want to understand our country and ourselves, we need to know the character of the land and why people in this country act as they do. Therefore, this course covers the major political, social, economic, diplomatic, and military events that shaped life in the United States. The class will focus on more modern topics. The first semester will begin with an investigation of some of the foundational ideas of the country (by looking at the Declaration of Independence, Constitution, and the Reconstruction Amendments), then move to the ‘Gilded Age’ following the Civil War and will end with the Second World War. The second semester will begin with the changes in American life in the 1950s and will end with an overview of the U.S. in the early twenty-first century. The focus on more modern topics will allow for two primary goals to be met. First, we’ll see more clearly where the factors directly affecting our lives today came from. Second, there will be room for more small-group or individual investigation of topics of special interest. The course requires students to learn specific factual material, using primary and secondary sources, then analyze and synthesize that information through taking tests, writing essays, writing papers, and completing projects. The AP U.S. History course covers the historical development of the U.S. from colonial times up to the 21stcentury. Students have to study and comprehend many specific historical events from this time span, as well as understand and connect them through the seven themes of U.S. history called out by the College Board: identity, work, exchange, and technology, peopling, power and politics, environment and geography, culture, belief and ideas, and America in the world. The AP U.S. History course follows the guidelines and requirements provided by the College Board’s Advanced Placement program, and it is taught with the academic expectations and rigor of a college survey course. Consequently, the amount of reading, testing, and writing is significantly more than the regular U.S. History course. Ancient Greece is a study in contradictions: they honored gods who kidnapped women, they valued the study of nature and saw truth in mathematics, they defeated the most powerful empire of the age, and they in turn were defeated by a general who loved their myths. The class will consider these contradictions and how they have influenced modern attitudes toward democracy, law, truth, and drama. Students will focus on primary sources and projects using discussion for information discovery and sharing. The Cold War ranged from 1945 to 1991, involving a great deal of the world. The threat of nuclear war, the orientation of society, entertainment, and politics around ideology, the use of covert political operations, and the use of outright military force pervaded this age. While the conflict centered around the United States and the Soviet Union, the course will also look at how other countries both viewed the standoff and were affected by it. Topics for this class will include the “hot wars” (Korea, Vietnam, Afghanistan), decolonization and the effect of the Cold War on the “Third World,” the Red Scare and how the Cold War affected entertainment, and the effects the Cold War had on politics and society within the US, USSR, and other countries from Latin America, Africa, the Middle East, and Asia. As sources, the class will use primary and secondary texts, as well as excerpts from appropriate literature, film, and TV. The class is a survey of the basic terms and concepts in microeconomics and macroeconomics. The primary reading is from a formal introductory text. Supplemental reading and studies include primary sources, articles, and current issues. This semester-long course will introduce students to numerous topics within the American legal system, including constitutional law, criminal law and procedure, tort law, and contracts law. Students will read challenging cases and articles in order to develop a better understanding of how the American legal system seeks to balance different interests in an effort to maximize fairness and justice. In doing so, students will be able to form their own opinions about the effectiveness of the justice system and consider possible legal reforms to help meet the justice system’s goals. Students will also write a research paper and perform an oral argument during the course of the semester. This course will span recent African history from the period just prior to modern colonization to the present (~1850 to 2019). Among several others, the main topics discussed will be imperialism in Africa, decolonization and independence, and the post-independence period. For each of these we will overview the history generally and then focus in on the case studies that best illustrate the impacts of the systems at play and the experiences of individuals. We will be approaching these topics from multiple perspectives and historical schools of thinking. We’ll look at the ways in which African history has been impacted by assumptions and biases and the ways that historians today work to improve our understanding of these histories. Students will be using a variety of texts, videos, and other sources throughout the course, including primary sources whenever possible. Sociology is the study of people in groups. This class investigates how the structures of society affect human behavior and interaction. The course takes a Social Issues perspective as students learn to use sociological frameworks and specific theoretical perspectives to creatively and deeply analyze the United States. This course entails both a general study and comparison of several of the world’s major religions. Major units of study will include Judaism, Christianity, Islam, Hinduism, and Buddhism. Other traditions, including those of indigenous cultures from around the world, will also be investigated. The course seeks to expose students to the core history, beliefs, tenets, and practices of these faiths, and then search for shared themes to be further explored in the comparative portion of the course. Along the way we will use various texts, videos, and special guests to gain our best possible understanding of the world’s religions. Psychology is the systematic, scientific study of behaviors and mental processes. In this year-long course, students will be exposed to major thinkers, famous experimental studies, key concepts, and methods related to the field of psychology. This course follows the guidelines of the College Board’s Advanced Placement program and is consequently taught at an increased pace and with the heightened expectations of a college course. This AP Government & Politics: United States course addresses numerous topics including the history and content of the Constitution, the details of the legislative, executive, and judicial branches, and the interaction of all three. It also covers other subjects such as federalism, elections and campaigns, political parties, civil liberties, interest groups, and the relationship between the media and politics. This course follows the guidelines of the College Board’s Advanced Placement program and is consequently taught at an increased pace and with the heightened expectations of a college course.